Beloved masters, during these unsettling times of great change while, seemingly, unending catastrophes and suffering are taking place around the globe, we wish you to know that we are always here to assist you and show you the way. One of the greatest gifts during these times of human evolution is your conscious awareness of your intimate relationship with the angelic realms. It has been addressed and explained many times before, but allow me to refresh your memory once more as to how the angelic realms fit in the Creator's grand plan, along with a brief overview of what our functions are. During these times of the great awakening of humanity, those of you who are in the process of integrating the many attributes and talents of your Higher Self, and who have tapped into the storehouse of wisdom of your Sacred Mind, are beginning to gain an understanding of how the universal laws work within your multidimensional world of reality. We have told you many times that you must evolve out of the "limited emotional concepts of religion/spirituality," and begin to learn and abide by the sacred science and universal laws of spirituality. We have explained in great depth about the multitude of Pyramids of Light that are scattered throughout every dimensional level of this Sub-universe. We have explained in great detail how you can create an etheric work pyramid within the fifth dimension where you may plant the Seed thoughts for any new creations you wish to manifest. You can also go there and through a ritual of forgiveness, break any and all discordant agreements that you have created with others from your past, present and future, thereby clearing any and all negative vibrational timelines. When you focus on a particular person, it will be his/her Higher Self that takes them into your work pyramid; he/she will be transported into the pyramid in their etheric body, enclosed in a sphere of protective Light. You should always envision a person's Higher Self standing behind them, and your Higher Self will also be directing you. For those with a compassionate nature, down through the many ages, no matter the race, culture or religion, there has always been an inbred desire to pray for or to send loving thoughts and energy to others, especially to loved ones who were/are in distressful situations or experiencing great sorrow. In the past, this has always been a loving act of faith, for hardly anyone was aware of how or if this wondrous gift was received by the intended recipient. 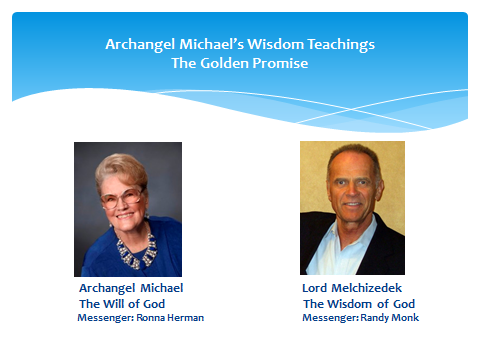 We have explained this concept to our messenger, and she has shared it with those who are actively studying our teachings in-depth via the ongoing webinars she and her spiritual/business partner, Randy Monk, present on a regular basis. There is a division within the angelic realm called: the Angels of Mercy. This powerful group of angelic Beings is under the direction of the Feminine Archangels and the Order of the Goddess. They convey all the attributes, qualities and virtues of our Mother God, and it is their mission to receive the unconditional Love/Light that anyone sends to another person. If the intended recipient's heart center is open and receptive, the Love/Light will flow into their auric field, and it will slowly be integrated into their four lower bodily systems, thereby giving them access to a special infusion of God Light. An Angel of Mercy will always appear and stay close to a person who is being sent pure unconditional Love/Light. For those who are still stuck / suffering in the density of the third and lower fourth dimensions, the Angel of Mercy will integrate the Love/Light and store it within their Sacred Heart Core, so that it will always be readily available when the intended recipient is ready to open their heart center to receive the precious gift of love. If a person never removes the shield of negativity and opens their heart center during this lifetime, the Angels of Mercy watching over them will go with them when they pass into the next realm. The Angels of Mercy will hold in reserve the loving energy you have conveyed to your loved one until he/she is ready to "awaken." It should be a wondrous comfort to you to know that the recipient will be aware of who sent the priceless gift of love to them. Remember that you do not send Adamantine Particles of Creator Light directly to other people; you are sending them Love/Light, which will be monitored by your Higher Self as to the appropriate "formula of Love/Light" for that person. It will also be monitored by the other person's Higher Self as to when and how much of your gifta person will be able to integrate at any one time. As we have explained many times, we give you these concepts in the simplest terms possible for your better understanding. However, you should be aware that all of the higher truths are much more complicated than you can understand at your present level of consciousness. We are revealing and explaining more and more universal concepts as you grow in Self-awareness, and as you experience the new, more powerful frequencies of Light. As you are ready to integrate it, we are gradually refining and expanding your cosmic knowledge. The more refined frequencies you integrate, the stronger your desire will become to share the powerful loving energy you feel pulsating from within your Sacred Heart center. You will begin to expand your vision, and your loving energy will flow forth beyond your family and close circle of friends, as you include more and more people, until eventually you will gain a group consciousness that includes all humanity, the Earth and all Creation. There are many levels and departments within the Celestial Hierarchy of angels, which are still only one facet of the Creator's conscious expression of Self. We, the archangels, carry the attributes and virtues of God consciousness, just as you do. But the difference is that we radiate specific attributes of the Creator-you might say the driving force for several major aspects of the God Mind. We embody faith, love and absolute obedience to the Creator and our Father/Mother God, always. The angelic realm in its many expressions was created by the Creator to assist, guide, nurture and instruct you, the bold ones, who agreed to diminish yourselves into lesser beings in order to experience God consciousness in its most fragmented forms. Originally, you embodied all the aspects and attributes of the God Mind, but gradually as you journeyed down through the ages and the higher dimensions, you left your higher consciousness in the care of your I AM Presence. The Elohim, the mental radiance of the Creator, the great builders of form, and the wondrous Devic and Elemental Kingdoms, who helped create and now oversee the entire nature kingdom on Earth and in other worlds, are also standing by to assist you in these turbulent times of transition. We hope you have accepted as your truth that you all have guardian angelic Beings who were assigned to you at the time of your birth, who will guard and serve you faithfully within the limits of Universal Law, and to the degree that you will allow. There are other wondrous angelic Beings ready and willing to serve you, but you must ask, for they are not allowed to infringe upon your free will. Love and joy attract angels like a magnet, for their greatest desire is to be of service to humanity. Begging is not the way to gain their favor, but asking them to assist you in your endeavors will assure their cooperation. They will help you to manifest your dreams, if what you desire is for the highest good of all; however, you must understand that it will happen in their time and in their way. The concept of money is confusing to them; instead, ask them to assist you in manifesting abundance, joy, love and peace-this they understand. But you must also do your part by taking the necessary steps, as well as eliminating any self-sabotaging beliefs that you still harbor in your subconscious mind. There are loving, angelic Beings to help you with affairs of the heart, and your mental or creative endeavors-they will help you firm your resolve and work with your Body Elemental to bring about good health and well-being in your physical form. The wonderful, playful cherubic angels are waiting to bring you joy and a sense of lightheartedness. These precious, little Beings of God Light love to be near you and to surprise you with little miracles or coincidences. Ask them to help you find things that are lost, and you can learn to communicate with them as well, but their language is a language of feelings and thoughts rather than words. They will cause "angel bumps" to rise on your skin when a truth has been stated, and they will buzz you with an angel kiss or sometimes surround you in a lovely fragrance. The angelic realm brings the love and radiance of God to humanity, and the angels' greatest desire is to be of service. The Essence of angels comes to Earth in embodiment through people like you and you and you-they come to be the representatives of the great archangels and to walk amongst humanity to share the virtues and attributes of God consciousness. Yes, they are just like you, and you may be one, my precious friends, making your way through human evolution as you grow from the lower rungs of the evolutionary ladder through study, work and service. There are representatives of every level of God consciousness on Earth at this time, embodied in the physical expression in order to anchor the most lofty, rarified aspects of the Creator. Have we not told you that you are more magnificent and precious than you could ever imagine? Dear ones, let us now continue to build the vision for the future of your world. You must realize that, first, you begin to build your vision in the higher realms of unlimited possibilities. Your thought forms slowly take form as they draw forth more Divine Creator Light substance, and then gradually begin to manifest in the physical expression on Earth. The greater the focus and intent, the more quickly your vision will manifest. As you come together in unified, conscious intent with the good of all as your motivating force, you create a synergistic thought form of dynamic proportions. This is why you are now making such inroads in the mass consciousness mind set. As spiritual Light warriors, even though your numbers are fewer than that of the masses, you are making great progress because of your unified, empowered thoughts of love, peace, abundance and harmony for all. It is time to be bold and outrageous in your vision. Envision yourself as a loving, masterful sovereign entity, and then formulate in great detail how you will operate and function multi-dimensionally as a cocreator of love, Light, peace and joy. Begin to look at fear in a new way. State to yourself until you believe it: "I have a new relationship with fear. Fear is an emotion that serves me, and I AM always in control of my emotions; therefore, I AM in control of fear." Transcending fear means you can experience it, observe it, learn from it and then move through it. In this way, fear will serve you as a warning bell as to what you need to be aware of, what is out of balance-what you need to bring into harmony. Emotions consist of negative- or positive-energy thought forms, and you must control them instead of allowing them to become your master. Lay the foundation for the emotional nature of your vision. What makes you joyous and fills you with gratitude? You must allow your Spirit to soar; however, you must also nurture the inner child as well as the soul. Be willing to express and claim that which touches or nourishes the innocence within: joy, delight, spontaneity, or sadness, anger and fear-feel these emotions, but realize that you are not these emotions. Freedom of expression should be an important facet of your vision. Know that you have a right to be completely spontaneous and follow your own inclinations and desires as long as they are for the greatest good of all. Begin to expect the best of people, and they will meet your expectations. Claim and envision your life being filled with miracles, beauty and joy; and gradually, your grandest affirmations will come true. As you support, love and cherish all things, you will receive support, and you will be loved and cherished in return. *Portions of this message were excerpted from SPEAKING OF ANGELS, The Golden Promise, page 386. DEAREST FRIENDS: Many of you are aware that this past year, I have been experiencing, what Archangel Michael has called a "Rite of Passage." I have been married to my husband, Kent, for forty-five years, and we had many wonderful years together. However, sometime our loved ones choose a different path that we cannot follow, and we have to make some very difficult decisions. These past ten years have been a great test for me, especially the last two years. I have learned so much about staying centered within my heart, while rising above the negative situations with compassion and forgiveness. Beloved Michael said to me during this difficult process, "Remember, beloved, the Path of Light is also the Path of Freedom." It was not my choice, but my husband allowed one of his sons to convince him that divorce was the best course of action. It was a drastic decision I would never have considered; however, I can now see that, no matter how painful, it will be for the best. I have learned so much during the process, and I have released everything in my life to our Father/Mother God, and in service to my spiritual mission. I am at peace within my heart, and I know this is all part of my personal ritual of passage. I hear from so many people these days that are being tested to the maximum in many areas of their lives. The tests we are experiencing are about maintaining our integrity, but also about taking our Spiritual Power. This is not an easy task for many of us, for we have always been followers, caregivers, and willingly assuming a "support position" most of this lifetime, and I am sure, in many past lifetimes as well. Archangel Michael has also told us, "We are to be actively assertive, with a loving overlay." It seems we are being prepared for the next big step into a higher frequency State of Being; therefore, we must release all the fear, and the deep residual negative energy from within, so that we can function appropriately within our new environment. My former husband, the father of my three children, has passed away, and so I have chosen to take back their family name: VEZANE. I have four grandchildren and two incredible great grandchildren, and our precious Zoey Ronna Vezane will make her entrance into this world any day now. We are a very close and loving family and spend as much time together as possible. I have chosen to use RONNA, my first name only, as my professional name; however, my legal name will now be RONNA VEZANE. Webinars are more fun with friends - please share. Please help spread the word about this free global event to anyone you feel might benefit. Pamela will share a group message from the Angelic Realm with the intention of what would serve the participants the most at this time to be aware of. Peggy will share Transformational Sacred Sounds. Randall will provide a meditation enabling you to connect directly with your Sacred Heart. We will also be sharing information about our upcoming June event The Gathering - Mt Shasta. You can access a replay of this event at the same link as the live event. Spend a transformational week... or a few days in the radiant energy of magical Mt. Shasta with soul family. Speakers include Pamela Shelly, Peggy Black, Cindy Cruess, and Randall Monk.